Karen MuirWe are pleased to welcome back Karen Muir who will speak on ‘What Makes a Good Paph’. Karen is an expert on Paphiopedilums, also known as Slipper orchids, and her talk will describe the better tried and true parents for good general paphiopedilum breeding and what they have contributed to good paphs. Karen also will include her experiences on orchid culture for successful growing of this fascinating class of orchids. Karen’s visit is being co-sponsored with the San Diego County Orchid Society. She will be speaking Tuesday evening on ‘Dendrobiums of Asia’ and all are welcome to attend her talk in Balboa Park. The June plant table will be comprised of a variety of blooming and non-blooming orchids, including a few paphs, selected from last month’s auction. Karen is originally from Michigan where she began raising orchids around 1972. 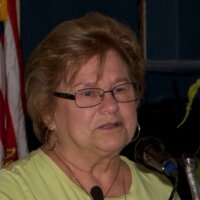 She was a member of the Michigan Orchid Society and held all of the offices of the Society including show chair, program chair, vice president and president. Karen became an accredited American Orchid Society Judge in 1997. In 1998, she was transferred by her Company, Lincoln Mercury, to Irvine, California and retired in January 2002. Karen also served 5 years as the American Orchid Society Chair of the Pacific South Judging Region and has traveled to Canada, Guatemala, Peru, Ecuador, Brazil, South Africa, England and Japan to attend and judge orchid shows. She has lectured on the Society circuit in the US, including the California Paphiopedilum Guild, the Slipper Alliance, NCOS (National Capital Orchid Society) Paphiopedilum Forum, two South African Paphiopedilum Conferences and the Paph Forum in London, England. Karen is now the Affiliated Societies Representative and Treasurer for the Orchid Digest. She resides in Laguna Niguel, CA.